Iron ore is an important raw material of iron and steel production enterprises in China, it is broken, grinding, flotation, re-election and other processes can be gradually selected steel, can be said to be a very important mineral resources, where the Shanghai Joyal mining machinery As a professional mine machinery and equipment manufacturers and we talk about what the iron ore processing process. Natural ore can not be directly used in our production and life, must go through some processing, and ore processing needs to use mining machinery and equipment, these mining machinery and equipment, including jaw crusher, impact crusher, sand Machine, sand washing machine and other mechanical equipment, then the iron ore processing needs to use which mining machinery and equipment? The whole set of iron ore sand making equipment usually consists of vibration feeder, jaw crusher, shaker, sand washing machine, tape conveyor, centralized electric control and other equipment, these machinery and equipment in the iron ore production and processing Very important position. 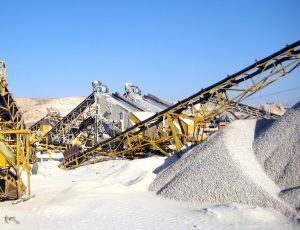 The iron ore is sent to the jaw crusher by the vibrating feeder evenly, and the material is crushed by the tape conveyor into the sand making machine for further crushing. The finely divided material is conveyed to the shaker for sieve Points, to achieve the finished product size requirements of the material was sent to the sand washing machine cleaning, cleaning by the finished belt conveyor output is finished.